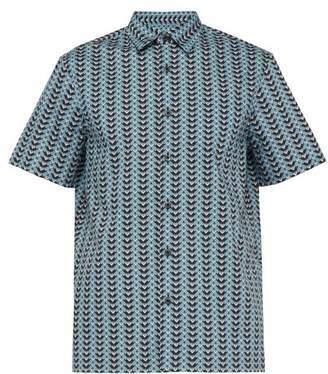 Prada - The intricate chevron print on Pradaâ€™s blue short-sleeved cotton shirt encapsulates the SS19 collectionâ€™s graphic mood. Itâ€™s Italian-crafted to a loose silhouette with a point collar and is punctuated by a chest patch pocket â€“ note how the pattern is masterfully lined up exactly, making it difficult to detect. Runs true to size.